The Friends of Hailey Park have raised over £4000 for the new playground. The group applied for a grant and had to raise 10% of the grant which they did by holding fundraising events throughout the community. The local children held a cake sale and a children’s fete and the community spirit was excellent. The new facility is fantastic and it is great to see younger children playing alongside older children. Huge congratulations to the Friends of Hailey Park – keep up the good work! 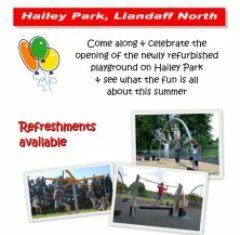 There will be an event on Saturday 11th August at 10am to celebrate the new playground. Hope to see you there!